in underwear, and gyrating young women meeting their every move. with a programme of modern works (Program B) and some old favorites (A). The RBC is anything but stodgy. These dances for the most part brought a welcome freshness to the David H.
Wayne McGregor’s “Infra,” set to a score by Max Richter, is a kind of deconstructionist version of ballet. There is lots of graceful and purposeful walking, including on the light screen (designed by Lucy Carter) where silhouetted figures appear over the heads of the dancers. exhibits classic and classy gravitas. Each work is beautifully danced. equally modern piece by Philip Glass, re-constructs. The work is full of longing. lifts were breathtaking, underscored by Richard Rogers’ music for Carousel. Alexander lead the cast in this lovely and compelling dance drama. New York was the Royal Ballet’s final stop on its US tour. There is always an embarrassment of riches in our fair city. So you don’t have to be embarrassed, we want to help you plan out your entertainment. Options abound in the next weeks, too. Warning: they are not in order of date or importance! Recess Monkey celebrates the release of their 12th studio album, Hot Air, with a high-flying summer of all-ages shows (see video above), including this one in Madison Square Park. See Seattle’s acclaimed indie rock band for kids for free. Adults welcome. 2. Folk-pop musical MIKE, inspired by a headless chicken, premieres at HERE for a strictly limited engagement, beginning on Tuesday, June 23rd at 7pm. Throes Theater announces New York premiere of MIKE, written and directed by Alexandra Zelman-Doring. This fanfare event is based on a true story of a headless chicken, and promises to offer plenty of surprises. 3. FRIGID New York @ Horse Trade is presenting the first annual Queerly festival June 25-July 3 at The Kraine Theater and UNDER St. Marks. A black drag king does karaoke, there’s gay Canadian burlesque and comedy, and a queer sports rom-com in this festival of all things Pride! Thus Spoke the Spectacle is a deconstruction of the media onslaught into an edgy transmedia rock experience. Original live music, spoken word vocals, video and lights combine in a “review” of the news, advertising and hype that fills our world. Ten explorers. Four boats. One Grand Canyon. A one-armed captain. Men on Boats is the kinda true story of an 1869 expedition to chart the course of the Colorado River. Our fears of terrorism affect identity and lengthen the divide between peoples. Tunisian playwright and actress Jalila Baccar’s play gets its first English translaton performance. Araberlin is directed by the orizon Theatre Rep’s Artistic Director Rafael De Mussa, who also stars in the production. Is country singer and superstar, Justin Spears just a big phony, who uses everyone in his life? Bruce Norris (Clybourne Park) has written another suburban tale, this one about wife-swapping newbies. It’s often hard to navigate the sensitive and precarious raltionship between siblings. Playwright Melissa Ross has a good ear for familial strife and tenderness. Of Good Stock is moving. The standout ensemble, lead by Jennifer Mudge and Alicia Silverstone, and directed by Lynne Meadow, is convincingly natural; we believe they are family, and that they care for each other. Visit http://ofgoodstockplay.com/ for more information and tickets. 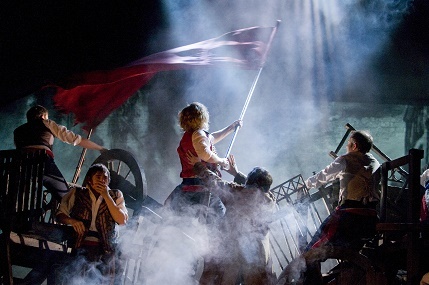 “Drink with me to days gone by:” Cameron Mackintosh stages Victor Hugo’s revolution! Love and honor are redemptive influences, and monumental themes against which to profile a life. 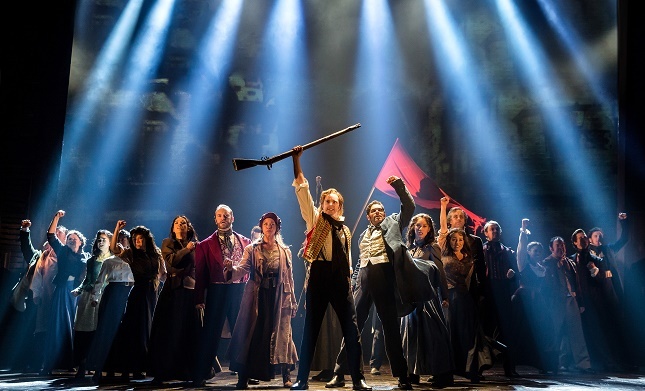 Cameron Mackintosh’s 25th Anniversary production of Boubil & Schönberg’s Les Miserables, at the Imperial Theatre, is about the triumph of the human spirit against adversity and misfortune. Victor Hugo’s novel, adapted by Trevor Nunn and John Caird, is the basis of this grand theaterpiece. Hugo’s epic is distilled into an operatic narrative for which Alain Boublil created the libretto and original lyrics in 1980, in collaboration with Claude-Michel Schönberg and with English lyrics by Herbert Kretzmer. The music in Les Miz–as it is affectionately called– swells and falls lushly in rousing melodies. The story covers alot of ground from a prison in 1815 to the barricades of the Paris rebellion in 1832. The revolution of 1832 was a kind of follow-up event. The Bastille was stormed in 1789 and the French had a new and beneficent monarch by 1832. Nonetheless, income inequality grew and the problems of the downtrodden poor worsened. It is the student uprising in June of 1832 in Paris that is the culmination of Broadway’s big chronicle. Les Miz is a stirring musical theater event. 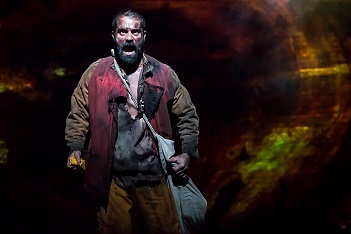 Jean Valjean (Ramin Karimloo) is released from prison for stealing a loaf of bread to save his sister’s son, aided by a benevolent priest (Adam Monley) and then pursued by the strait-laced policeman, Javert (Earl Carpenter.) The priest’s act of kindness towards him elevates the convict and transforms Jean Valjean into a man. Javert only sees things as black and white; those who once committed any crime will always be criminals in his world. Jean Valjean reinvents himself as a productive citizen. He finds purpose for his wealth in saving Fantine’s (Erika Henningsen, in a Broadway debut) daughter Cossette (as a child, Fabi Aguirre.) He owes a debt to Fantine because he ignored her plight when she worked in his factory. Les Miz’s anthem, “One Day More” in a photo by Matthew Murphy. All the humor in Les Miz falls on the skinny shoulders of “The Master of the House,” Thénardier (Gavin Lee) and his Madame (Rachel Izen.) They are comically corrupt and greedy souls who prey on those as poor and downtrodden as they themselves are. They are outlaws, with no revolution in them; their zeal is for acquisition and stealing. Unlike Valjean, and even Javert, these characters do not grow. Their daughter Éponine (Brennyn Lark, another fine Broadway debut), once pampered by her ma (the young Éponine, played by Lilyana Cornell) is a street waif in her father’s gang whose love for Marius gives her transcendence. The costumes (by Andreane Neofitou and Christine Rowland) underscore the differences between the struggling poor and the well-to-do, and set the time for the action. The sets and images are based on Victor Hugo’s paintings and designed by Matt Kinley. The 25th anniversary production, at home on Broadway since March 2014, is directed with all its moving parts and grandiloquent staging, by Laurence Connor and James Powell. “I was gob-smacked,” Faith Prince says during a recent cabaret event. And, by golly, if the 92nd Street Y audience doesn’t get it! She is the consummate New Yorker (by way of a small town in Virginia upbringing.) She is also a consummate performer. Her cabaret act offers many highlights, not least songs from her Tony-winning turn as Adelaide in Guys and Dolls. She also reveals just why she would have been a marvellous Audrey in Little Shop of Horrors, if only… but let her tell it when you catch the act. Look for Faith Prince on Broadway in The First Wives Club, currently in development soon. Or catch her in cabaret. There are not many things to inspire the complacent bourgeois to storm the barricades. This musical always has always succeeded in getting my blood up. Les Miserables, at The Imperial Theatre since March 2014, first opened to Broadway acclaim where it ran until 2003, was revived in 2006, is a 25th Anniversary revival. The original production has been revitalized with a cast too young to remember the first time around. 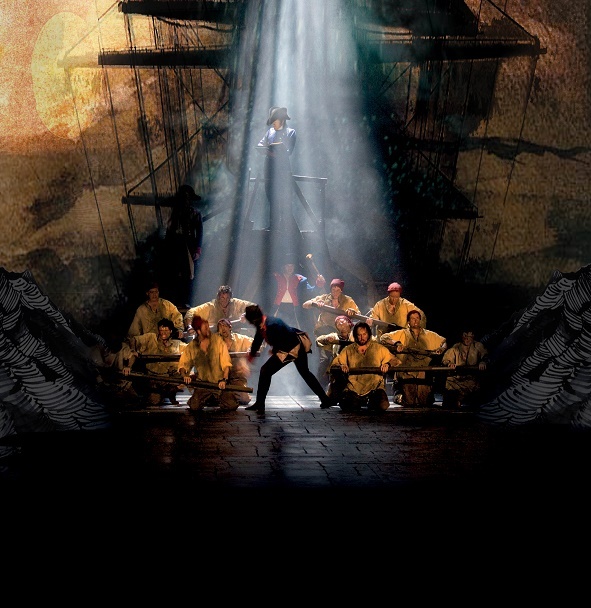 Les Miz, as it is affectionately called, is a stunning masterpiece combining revolutionary zeal with soulful heartbreak, all set to stirring music and song. Ratmansky’s The Sleeping Beauty today at the Met, is part of the 75th Anniversary celebrations of the ABT.